The snow-laden slopes of the San Bernardino and San Gabriel Mountains have beckoned Southland skiers since the 1930s. Many once-cherished ski areas have disappeared, yet their history remains. A short drive from the sun and sand, places like Rebel Ridge and Kratka Ridge offered snowy escapes. Thrilling races were held at the First International Pine Needle Ski Tournament in North Hollywood, while the San Diego Ski Club boasted Dorothy McClung Wullich, the first female member of the National Ski Patrol. 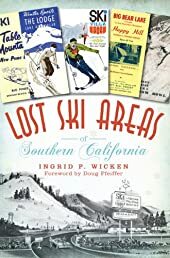 Ingrid Wicken, ski historian and founder of the California Ski Library, chronicles Southern California's lost mountain getaways and the vanished ski areas that introduced everything from rope tows to artificial snow.